An eccentric medium (Margaret Rutherford) conjures up the ghost of author Rex Harrison’s deceased wife (Kay Hammond), much to the consternation of his new wife (Constance Cummings). 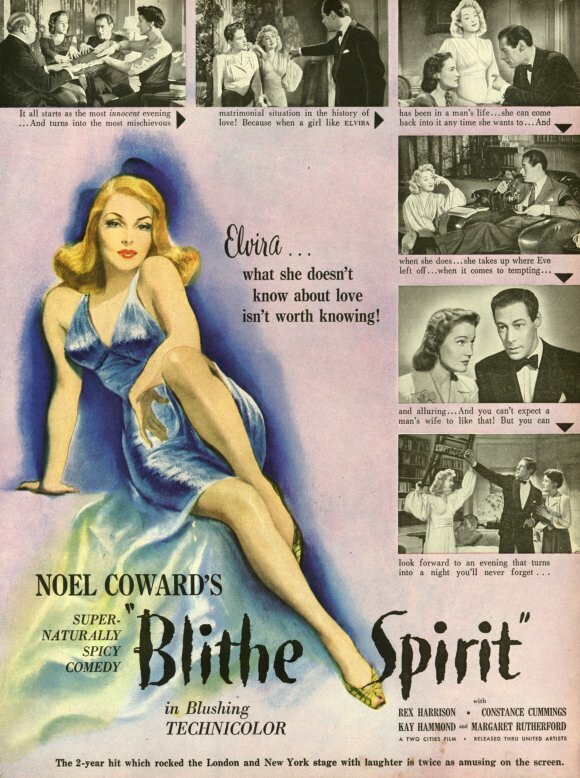 David Lean’s adaptation of Noel Coward’s popular play is a uniquely comic look at life-after-death, one which makes good use of marital insecurities. Never before has a deceased wife caused so much trouble for the woman who has replaced her! As Peary notes, Harrison’s ego is inevitably stroked when he realizes he has two women fighting over him; despite his henpecked consternation, there’s a part of him that’s downright tickled. However, the highlight of the film is undoubtedly Margaret Rutherford as the sincere but trouble-making medium, Madame Arcati. From the moment she appears onscreen, riding her bicycle down the street with a satisfied grin on her face, she is enchanting. This is truly one of the greatest character performances of all time. Yes, simply for Rutherford’s performance. Anything with Margaret Rutherford is worth watching. I really hope someone decides to put her Miss Marple movies out on video. A must – but mostly as cinema history. Although not of his best work (film work, at least), it has importance since it was written by the renowned Noel Coward (at least the play was; the adaptation, for some odd reason, took director Lean and two others to handle!). Haven’t read the source in a long time but, like the ghost of Elvira, one can sense enough of Coward’s presence. Rutherford does indeed steal the show – and one wonders what to make of any possible sexuality here. As Ruth, Cummings (on the surface) appears to be simply a shrew – but hers may actually be the most difficult role. I wish Hammond had been given a sufficient number of memorable lines. Harrison is as stuffy as he’s called on to be. The last five minutes – a real departure from the play, apparently – cause a letdown (esp. re: ‘logic’), but perhaps not from a ‘commercial’ perspective. My favorite visual touch: Madame Arcati’s parrot is intensely jolted at the sight of Elvira.